Should you repair or replace your driveway? Does your concrete driveway have cracks, breaks, or other damage that is hurting your curb appeal? Your driveway shouldn’t be an afterthought or an eyesore! However, it can be difficult to decide whether your driveway warrants a repair or a full replacement. That’s why we are breaking down your options to that you can make the best decision for you! Whether your concrete driveway has a few breaks, could use some new finish, or needs a complete overhaul, in this post we will compare the costs and benefits of choosing to repair vs replace your driveway. Assessing the Damage – Does Your Driveway Need a Makeover? 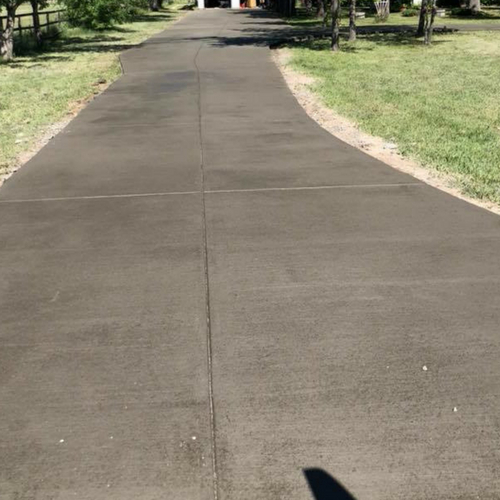 Though you may expect that your concrete driveway is, well, “tough as concrete”, the reality is that driveways can go through quite a bit of wear and tear. In fact, there are some telltale signs to look for to know if your driveway needs a repair or replacement. If you suspect that your driveway has or could have any of these issues, it may be time for a repair or replacement. Either way, you will have a brand new driveway to enjoy in the long run. The good news is that you have options! Below, we cover the basics of concrete driveway repair vs replacement to help you find the best solution! Repairing or resurfacing your concrete driveway is a cost-effective solution to fixing surface-level cracks, sealant wear-and-tear, and more. In other words, you may decide to repair your driveway rather than replace it if the damage is minor and the integrity of the concrete is still intact. Repairing the concrete typically involves using a product to fill the existing cracks and then applying an overlay to seal it. This method, otherwise known as resurfacing, is a easier and more affordable solution than replacing the driveway altogether. Patching your driveway means filling in the cracks and holes, without the additional step of applying a new seal or overlay. The result can typically be reduced curb appeal, but this tends to be the cheapest solution. Replacing your entire driveway is much more involved but is highly recommended if your driveway has deeper cracks, foundation damage, drainage issues, or other major issues/damage. Replacing your concrete driveway means demolishing the existing concrete and pouring a completely new driveway. Many driveway owners find that the issue was poor ground preparation or reinforcement, so laying a solid foundation is important here. Replacing your driveway may be the more expensive option, but it is worth it to have a driveway that is safe, practical, and looks great! Repair vs Replace: What is the Best Option for You? 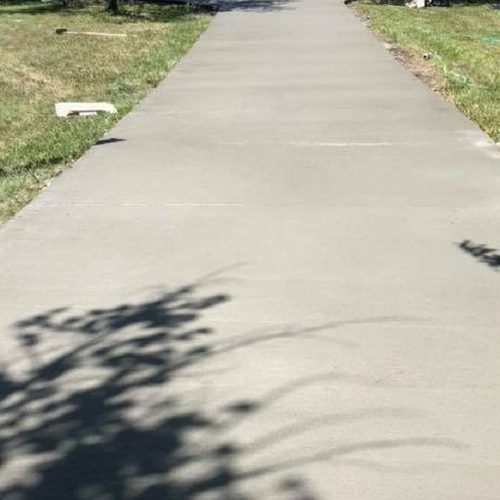 If you are facing the decision of either repairing or replacing your concrete driveway, it is worth talking to a trusted concrete contractor to discuss your options. As we described above, there are many types of damage that may determine the best solution for you – at varying price points. Ultimately, you want a driveway that looks great and serves its purpose for your home. Still have questions? Speak to a concrete professional about your options today!